In an announcement on November 29, 2016, Canadian Prime Minister Justin Trudeau approved two new major pipeline expansions for Canadian bitumen. Altogether, the two projects will add over a million barrels per day to Canada’s export capacity. The project currently has a capacity of 300,000 barrels per day and will be expanded to have a total capacity of 890,000 barrels per day. 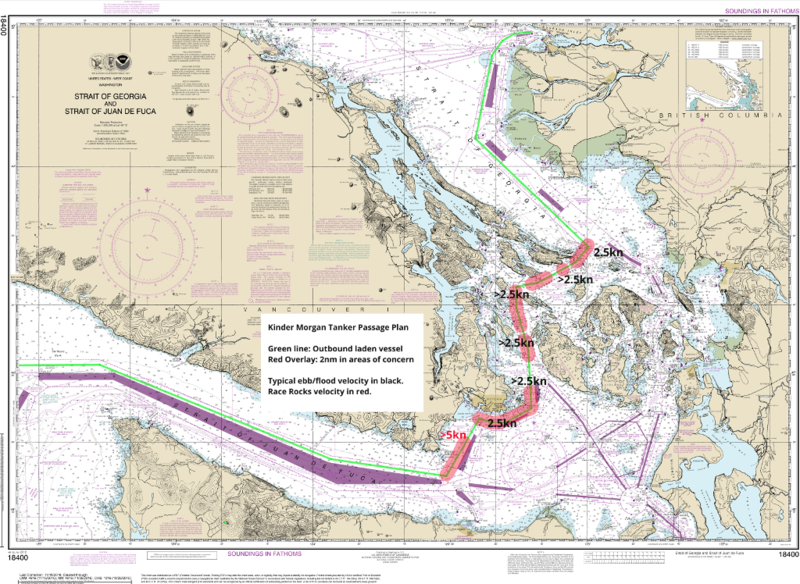 Around 400 Aframax tankers per year will transport diluted bitumen from the Westridge Marine Terminal, through Vancouver’s Burrard Inlet, then down narrow passages, with strong tidal currents, between the Gulf Islands, and finally through the busy shipping lane of the Strait of Juan de Fuca to the open ocean and markets around the Pacific. The project should be completed in 2019. The risk of a catastrophic diluted bitumen spill is a major factor driving opposition to this project. Climate-scientist-turned-politician Andrew Weaver articulated his concerns in a recent open letter to Justin Trudeau. This project will replace a 50-year old pipeline with a new, larger capacity one. The new pipeline will carry 760,000 barrels per day with potential to expand to 915,000 bopd. The old pipeline was restricted to 390,000 bopd for safety reasons. The Canadian section of this line runs from Edmonton, across Saskatchewan to Gretna, Manitoba, on the US border. The operator, Enbridge will also replace the US portion of the pipe, which runs from Neche, North Dakota to Superior, Wisconsin. Because this pipeline is an existing one, no presidential approval is required, unlike for Keystone XL. The project is expected to be operational in 2019. Altogether, these two projects will add 1.06 to 1.20 million barrels per day of export capacity. 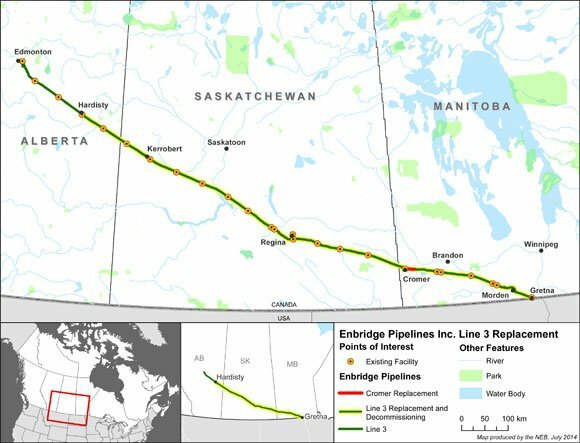 Additional export pipeline proposals include Energy East, a 1.1 million per day pipeline that will reach the Atlantic coast of Canada and the possibly soon-to-be-resurrected Keystone XL pipeline that will add about 800,000 barrels per day capacity to the US Gulf Coast. All in all, nearly 3 million barrels per day of additional bitumen capacity from the Athabasca oil sands, enough to more than double the current production of around 2.5 million barrels per day. This is a big win for Alberta’s oil sands business. And it has been delivered by Canada’s Liberal government, which is committed to ambitious greenhouse gas reductions. This takes some explaining. The political background is complicated. For the benefit of those who don’t follow Canadian politics (and who could blame you for that), here is an outline. The shorter version, should you choose to skip this section, is that the pipeline approvals are part of trading concessions between Canadian jurisdictions and are designed to give political cover for new climate mitigation policies. The oil price crash in 2014 provoked a severe recession in Alberta. Job vacancies have halved and unemployment has doubled. People are hurting badly after years of boom times. In a political earthquake in May 2015, Alberta’s voters elected a centre-left government under Rachel Notley. Justin Trudeau became Prime Minister of Canada later that year. Alberta’s government is dependent on revenues from resource royalties for a large part of its budget. Currently, the province faces a budget deficit in excess of C$10 billion. Royalty increases are not feasible during a downturn and large tax increases and/or spending cuts are deemed politically impossible. Global commodity prices are obviously beyond the control of any government. This means that the only way to achieve a balanced budget is to increase oil production. However, it is widely assumed that increases in production are impossible without increased transportation capacity and access to markets other than the USA. It is not just the Notley government that wants to expand production. So too does the Trudeau government and all politicians in Alberta, including the progressive mayors of Calgary and Edmonton. The Notley government, to its credit, introduced a Climate Leadership Plan, which among other things, imposed a carbon tax of C$30/tonne CO2e effective in 2018 ($20 in 2017) along with an all-time cap on upstream emissions from the oil sands of 100 million tonnes of CO2e per year (they currently stand at 72 Mt). This policy has proved unpopular in Alberta and, even though no tax has yet been imposed, opposition politicians are blaming Premier Notley’s climate policy for the downturn. Notley has justified the emissions policy on the grounds that it is essential for earning social licence for oil sands expansion. The Trudeau government announced that the Federal government would be introducing a carbon tax, rising to C$50/tonne by 2022. If provinces have their own pricing, that would be deducted from the federal levy. Any money collected would be returned to the provinces to spend as they wish. The federal policy was rejected by Saskatchewan and accepted by Alberta on the condition that export pipelines be approved. After the pipeline announcement, Notley immediately endorsed Trudeau’s federal carbon tax proposal. Trudeau claims that the pipeline approvals are determined by science, not politics. This, of course, is bunk, as Andrew Weaver testily explains in a radio interview. It’s politics all the way down. The entire policy is designed to find a middle path between conservatives who are oblivious to climate change and environmentalists who, some allege, are indifferent to the economic fate of Albertans. Trudeau says that the economic growth of the oil sands is required to pay for climate policies. He does not explain how this money will be transferred from fossil fuel companies to environmental good works, nor is there any account of why the past oil boom did so little for climate progress. The opposition to the TMX project in BC is very strong and has probably been underestimated by Trudeau. At hearings in BC for the pipeline, some observers estimated that 90% of the submissions were opposed. All of the coastal mayors along the pipeline route are fiercely against it. Well-funded environmental activist groups are already planning massive civil disobedience. Some predict that the protests in BC may be bigger than the so-called “war in the woods” in which activists successfully disrupted logging operations on Vancouver Island, in 1993. It would be a mistake, however, to think that BC‘s opposition is limited to environmental activists. Opponents of the TMX project come from a wide cross-section of society who resent the imposed threat to BC‘s splendid coast. BC Premier Christie Clark has stipulated five conditions for her to be able to endorse the TMX project. These include successful environmental reviews and consultations with First Nations. Another stipulation was having a world-class response for dealing with oil spills at land and sea. (Added later for clarity, following a reader’s comment on Facebook: Trudeau’s plan may be enough to allow Clark to claim that her condition has been satisfied, but it will still be insufficient to deal with a spill of diluted bitumen that sinks, see Andrew Weaver’s letter, quoted earlier.) Trudeau has delivered on a $1.5 billion marine spill response plan. The remaining condition is for BC to get more economic benefit. As things stand, BC takes most of the risk of a pipeline and earns few of the rewards. Only 90 long-term jobs are expected to be created in BC by the project. Premier Clark has staked her political future on developing a Liquefied Natural Gas industry in BC. Recently, the Trudeau government approved a major project, the Pacific NW LNG project, which, if built, will be one of the largest single greenhouse gas emitters in the country. The project also has unresolved issues with First Nations. Cynical observers might well conclude that this approval was granted to earn a quid pro quo from Clark. We’ll see if she endorses the pipeline soon or if she continues to sit on the fence. Trudeau may well have made an expedient political calculation on TMX, trading votes in BC against votes in Alberta and Saskatchewan, but the decision was nonetheless a bold one, a choice that will likely define his premiership. Of course, the physical world of climate change is indifferent to politics. If the export pipelines work as intended and boost growth in oil sands production (there are doubts about this, see below) then, even with Alberta’s new policies, the province’s emissions will equal around 250 Mt CO2e in 2030. Canada’s Intended Nationally Determined Contribution (INDC) pledge is to reduce the nation’s emissions to about 500 Mt at that time. This means that Alberta, with about 12% of the country’s population, will be producing half of the emissions. 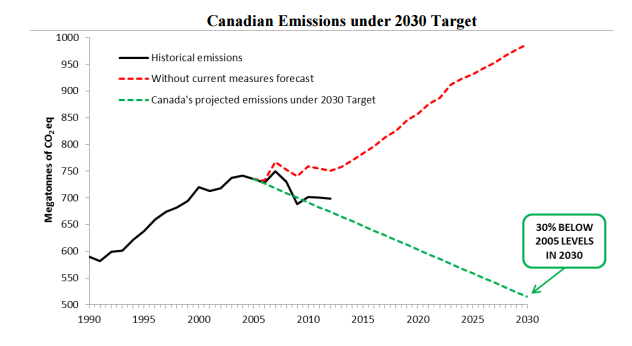 The 200 Mt of reductions needed to meet Canada’s 2030 goal will be borne entirely by the rest of the country. Alberta’s emissions, from Alberta’s Climate Leadership Report. From Canada’s INDC pledge. Note that the y-axis origin is not zero. If the country meets its 2030 INDC commitments, the approximate average per capita emissions for Canadians outside of Alberta will be (assuming, for now, constant population) about 8 tonnes of CO2e. Alberta’s will be about 60 tonnes, a factor of seven higher. Many Canadians might well feel that these burdens are not being shared fairly. 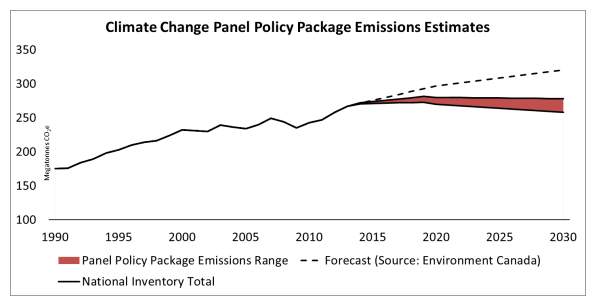 If Trudeau’s $50/tonne carbon tax is applied, EnviroEconomics estimates that the policy will reduce national emissions by 18 Mt per year. Assuming that the pipelines are filled with new production, the upstream emissions of the TMX project (i.e., the emissions associated with the production, not the consumption of the bitumen) are estimated by Environment and Climate Change Canada at 14-17 Mt per year. Similar upstream emissions will be attributable to the Line 3 bitumen. Claiming that approving pipelines is Realpolitik needed to get public acceptance of new climate policies is undermined by this consideration. Trudeau has replaced the important step forward of his carbon tax with two steps backwards from the additional upstream emissions that will result from his pipeline approvals. Barry Saxifrage at the National Observer has a useful article showing the effects of other policies and infrastructure additions. He shows that all of the new fossil-fuel infrastructure swamps any benefits introduced by new mitigation policies. The main cause of Alberta’s recession is the post-2014 crash in oil prices. Existing oil sands projects can still make a small operating profit on a go-forward basis at current prices of $50 per barrel, but new investments require a much higher price. If as many believe, global prices stay low for longer, there is little prospect of an investment boom in Alberta, regardless of any new transportation options. However, many commentators imply that recovery is being significantly hampered by lack of access to tidewater and world markets. Bitumen is a low-quality oil that suffers a discount of somewhere around $20 per barrel relative to premium light oils like Brent. At present, nearly all of Canada’s oil exports go to the USA. There is a perception that that Americans are unfairly discriminating against Canadian bitumen and enforcing low prices. This is not realistic, because the US refining industry does not, cannot by law, behave like a cartel by fixing prices. Some Canadian bitumen producers, like Cenovus, are equity owners of US refineries. With the TMX project, Canadian bitumen exporters are hoping to open new markets in Asia. The case for this is speculative and, even if Asian importers decide to build refineries capable of refining bitumen, there would be no guarantee that market discounts relative to light oil would be less than in the US. In a world that is currently awash with oil that is cheaper to produce and of better quality than Canadian bitumen, oil sands producers are fooling themselves if they they assume that Asian importers are going to strike favourable deals. The IEA says that such measures [US CAFE standards] cut oil consumption in 2015 by a whopping 2.3m b/d. This is particularly impressive because interest in fuel efficiency usually wanes when prices are low. If best practice were applied to all the world’s vehicles, the savings would be 4.3m b/d, roughly equivalent to the crude output of Canada. This helps explain why some forecasters think demand for petrol may peak within the next 10-15 years even if the world’s vehicle fleet keeps growing. World oil reserves are at an all-time high. The USGS has just announced a huge, multi-billion barrel discovery of light oil in Texas in the Wolfcamp Shale. It won’t be easy for Canada to find new markets for its expensive, low quality oil in a world of shrinking demand and oversupply of cheap, light crude. Of course, emissions policies may fail and the global oil market may be upset by geopolitical turmoil. Nobody can predict what future prices and demand will look like. There are just too many unknowns. Independent economist Robyn Allen has harshly criticized the National Energy Board’s economic analysis of the TMX project. You can watch a presentation of her argument here. The original TMX project was conceived when oil prices were higher. The project was underwritten by 13 producers who committed to “take or pay” agreements (they are obliged to pay for transportation, even if they do not have oil available). The operator, Kinder Morgan, is poised under such an agreement to make money even if there is no oil to transport or markets to ship it to. The completion of the TMX project is far from certain. Lawsuits are planned by First Nations groups who say that they have not been adequately consulted. An OK from the BCgovernment has not yet been granted. 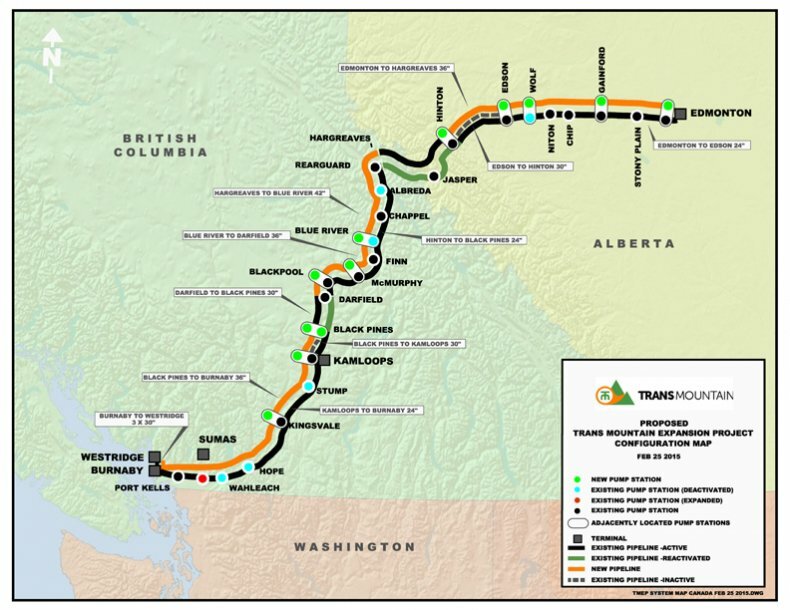 Although approval from Premier Clark is not absolutely required for this project to go ahead, a provincial government firmly opposed to a major project like this could cause delays in granting permits, if they wanted to. The biggest obstacle to the pipeline proceeding is likely to be public protest on the BC south coast. Much will depend on how the protests unfold and how much sympathy the activists earn from the public in Canada and abroad. However, there is little room for the federal government to maneuver or compromise. The pipeline will either happen or it won’t: Trudeau can’t order a scaled-back version of the project. In his announcement on November 29, he made it clear that his decision was final and that he considered the risks to the marine environment to be acceptable. It is hard to see how the decision could be walked back without a massive loss to his reputation and authority. Some argue that patriots should simply accept national infrastructure projects, as people did for the construction of the Canadian Pacific railroad. However, those living near to the railroad received direct benefits by being close to a unique transportation system. For oil pipelines, the risks and rewards are disproportionate: Alberta gets to reap nearly all of the profits of oil sands expansion, while BC gets to assume all of the risk of marine oil spills. In Canada, resource royalty revenues accrue directly to provincial treasuries. Although the oil and gas industries are an important part of the national economy, they account for less than 10% of GDP, less than most people imagine. The often-claimed necessity to keep growing oil production as the only way to grow the national economy is exaggerated. If TMX does get pushed through in the face of west-coast public revolt, Trudeau will pay a stiff political price, losing parliamentary seats in BC, while probably gaining very few, if any, in Alberta as compensation. The grossly unfair distribution of per-capita emissions in the country, should the climate pledges be honoured, will rankle. The result could be a bitterly divided country, which is unlikely to be the legacy that Justin Trudeau wants to leave. An excellent series of recent posts, Andy. They have too substantial for a quick comment to do them justice… I will try to get around to a more substantial discussion later. Thanks, Magma. I’ll look forward to your discussion. I’m grateful to get any commentary, especially corrections and disagreements.